The glamour, the romance of commerce… It's the very lifeblood of our country's society. Brad DeLong argues that investors can now expect a 7% return on their investment if they only dive into the SP500. Elsewhere, he argues that the equity risk premium is now 9%. I can buy shares in the SP500 and earn a whopping (annualized) dividend of 2%. Not 7%. After 90 days, I can sell my shares, absorbing any capital losses or gains. I compare that to holding a T Bill for 90 days, earning 0. For the risk premium to be 9%, that means the expected capital gain (annualized) on a 90 day hold of the SP 500 needs to be 7%. I wonder why Brad DeLong believes, with a dividend yield of only 2%, that investors will bid up equities by 7% over the next year. I think one problem is the assumption implicit in the Fed Model that investors can take delivery of earnings. They cannot. They can only take delivery of dividends and capital gains. Firms must constantly re-invest merely to maintain their market power — this is a separate issue from replacement of depreciated capital. Intel must continuously build new billion dollar chip fabs not because the old fabs have depreciated away, but because the old fabs are no longer economically competitive, and so their market value to Intel (and to investors) goes to zero much faster than their IRS approved depreciation rates, or than their BLS depreciation rates marked in terms ability to produce chips. The investments that firms make are highly speculative — HP spent a billion to buy WebOS, and invested another billion, after which they decided that WebOS was not competitive and shut down the project. Microsoft spends billions on R&D not to grow its earnings, but to maintain them, as no one is going to be buying the previous model OS or Xbox. Verizon must invest in new infrastructure to maintain its competitive position vis-a-vis AT&T. Then it must make additional investments to grow its market share and increase its revenues and earnings. Monopolistically competitive firms must constantly re-invest to create new products simply to maintain their market power. Investors only take delivery of dividends and capital gains. Whether or not earnings benefit investors is determined by the change in market cap of the firm, it is not determined by the dollar amount of investment made. Falling capital values means that even though firms continue to engage in speculative investment, the estimated long term profitability of the in place capital stock is questioned. Adobe, sitting on cash-flow pigs known as Photoshop and Illustrator has never paid out a dividend. Rather, it rolled those profits over into the acquisition of unprofitable ventures. The result was a decline of Adobe’s market cap even as Adobe earnings increased. An earning statement cannot be assumed equivalent to a coupon payment — to do so understates the risk of holding equities and overstates the equity risk premium. Although one can imagine that over long periods, the dollar amounts spent on re-investment do correspond proportionally to an increase in the profit earning potential of the firm, this does not happen automatically, rather it happens due to a series of adjustments. The market must tell Adobe, “No, your re-investment is not competitive” by discounting the market value of its stock. As it does so, this does not mean that investors are more intolerant or risk-averse. It means that they are signaling to the market that they do not believe an additional dollar re-invested by the firm will earn the same return as the firm is currently earning. These adjustment periods do not happen continuously, or instantly, but take many decades. We have recently been in a house price bubble, during which time the rental yield on housing fell to a historic low of about 3%. It is now closer to the long run average, around 5%. That increase from 3% to 5% does not correspond to an increase in risk premium. Rather, during the bubble, investors believed that they were getting a yield of 3% plus capital gains. Now, without the capital gains (and possibly expecting capital losses), they demand a higher rental yield. Their total risk tolerance may not have changed, even though the apparent yield demanded increased. The price that someone is willing to pay for rental property if they expect no appreciation is different from the price that they are willing to pay if they expect appreciation. The Fed model is the comparison of 10 year bonds with equity returns. Using the yield to maturity of the 10 year is problematic, as it assumes constant re-investment rates of the coupon, but holders of the 10 year bond will also experience capital gains over the course of their hold, and as they do so, they will not take delivery of the YTM return. We can get rid of this problem by comparing SP 500 returns to 3 month T bill returns, assuming that the SP 500 shares are held for 90 days and then sold. Everyone has the choice of sitting on cash-equivalents for 90 days or jumping into the market. They do not have the option of obtaining the YTM yield on the 10 year if yields are changing. The first thing to note is that at least ex-post, equity investors have taken a horrible beating, even as DeLong has repeatedly bemoaned their risk intolerance. Even though the average value (over the 70 year period) of the equity premium has been 7.14%, recent values have been negative. Investors would have been better off buying the T-Bills. There is no empirical basis to believe that investors are currently demanding a high risk premium. Not with dividend yields at 2%, and the real market cap of the SP500 in a secular decline. Rather, we see a situation similar to the 1970s, in which equity investors were routinely beaten with below average returns and above average volatility. That era was only brought to an end with rapidly falling (nominal) risk free rates, something not possible now. In the period of the 1940s, nominal rates were low but dividend yields were high, so there was reason to expect increasing capital gains if yields fell. With dividends at record lows, it is hard to imagine large capital gains. With no gain, the equity risk premium will be 2%, far below the 7% historical norm. The problem here is that with a nominal dividend yield so low, the duration of the stock starts to explode. At 2%, the duration is over 50 years; it is misleading to compare stocks to the current 10 Year bond. Assuming that we exit this crisis before then (and that rates rise), investors are being asked to absorb capital losses when interest rates go up. Low nominal rates increase duration and make investors more far-sighted, and therefore less response to the special circumstances of the present. They care less about the present 2% spread between dividends and 0% T-bills, and more about the future spread between dividends and 4% T-Bills. The more the central bank rushes to lower rates to address the current crisis, the more far-sighted investors become, and the less concerned they are about the current low rates. Therefore maintaining even the current market cap at a 2% yield is a sign of enormous patience and risk tolerance on the part of investors — the situation is completely different than if the short rate was at 5% and dividend yields were at 7%. Then we could be talking about high levels of risk premium. In a situation with low dividend yields and zero risk-free rates, what would drive the rapid increase in capital gains necessary to justify the historical 7% equity premium that DeLong believes investors have. The equity premium is currently much lower, and the prospects for equities are more grim. 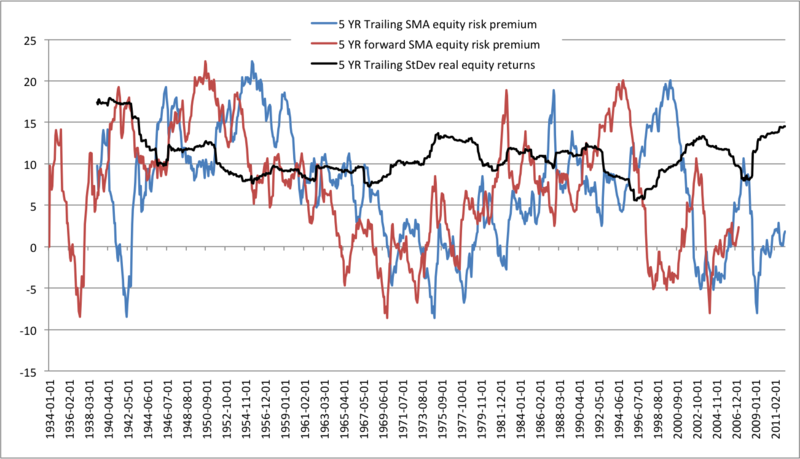 Rather, we are in a period of both low equity risk premiums and falling capital values. Investors are both skeptical of the sustained profitability of current firm re-investment plans and they are willing to accept historically low yields if those yields are believed to be sustainable. The only thing that equity investors have not been doing is obtaining total returns in excess of those holding 10 year bonds. Long time no post! I think the most apt comparison is with the 30-year TIPS. With a yield of only 0.5%(+CPI-U), investors are accepting a lot of interest rate risk. They just aren’t willing to accept economic risk. 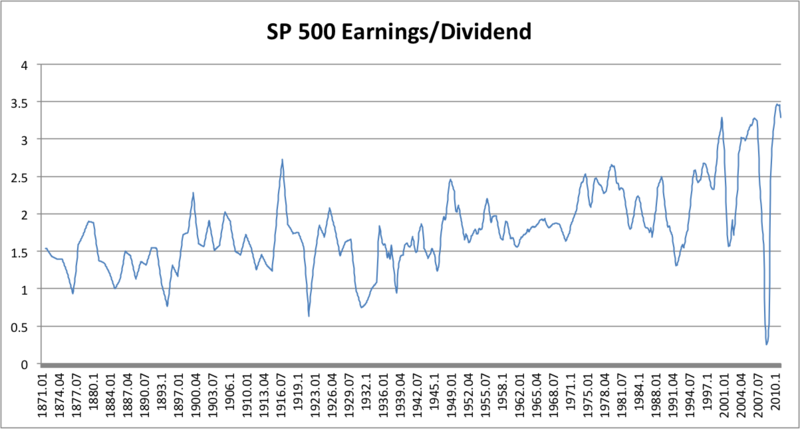 Also, using dividend yield as a statement of economic earnings is too pessimistic. If you add share buybacks, deleverging, and productive investment, a more realistic number is 4% for the S&P 500. I am using dividend yield + capital gains. The latter issues are delivered, or not, to investors via capital gains. You cannot buy groceries with a share-buy back plan, but you can with coupon or dividend payments, or proceeds from capital gains. The relevant yield for return forecasting is the sustainable economic earnings yield. The factors I mentioned are just to explain why this may be higher than the dividend yield. Of course you can lose big if the yield increases, but that’s also true for the 30 year bond. I am not comparing dividend yields to bond yields. I am comparing dividend yields + capital gains to zero coupon T bills. I am looking at the equity/cash equivalent decision from the point of view of an investor. Delong assumes that a 7% earnings yield means that the investor, if they sign up now, will get paid 7%. He even talks about “re-investing” this 7%. From my perch, the investor is getting 2% + the expected cap. gain. But the expected cap gain is not looking too good because nominal rates can only go up and the equity risk premium demanded cannot stay negative. At some point, investors will re-price stocks so that they are expected to outperform bonds by historical margins. When that happens, dividend yields will not be 2%. The reason not to expect 7% is because current profit margins aren’t sustainable. 12 month earnings are often misleading, so stock valuation gurus use things like PE10 or Tobin’s Q that filter out cyclical earnings. And then the argument becomes what PE10 or Q do you consider “normal” (long term historical average? last 30 years? something else?) and over what time frame do you expect the market to return to “normal”. It is more than that. When estimating risk premiums, you have to compare apples to apples. Cash paid out from the stock versus cash paid out from the bond. If a company earns a profit of 10%, but only pays out 1%, then 9% of the earnings remain at risk — you may not be able to take delivery of that 9%. You only took delivery of 1%. Whatever risk discount you apply will be greater to this firm than if the same firm paid out all 10%. Therefore when estimating what premium investors demand for risk, you cannot assume that they are taking delivery of earnings statements in the same way that they take delivery of bond coupons. They take delivery of only of capital gains + dividend yields. The real assumption of the Fed model is that $1 re-invested will create $1 of capital gains with absolute certainty. We know how accurate that assumption is. This is superb. Much, much better than my response to the same DeLong post. I do wonder, though, how we fit share repurchases into the picture. In many respects, it seems like they should be considered dividend payments, which would effectively double the dividend yield. Ah, I see you already answered this. Buybacks need to show up in capital gains to be worth anything to investors. OK. But you do then need to adjust your view of reasonable capital gains to account for share buybacks. In the pre-buyback world, a firm’s shares would not appreciate unless its expected earnings increased. WIn the buyback regime, you get some additional capital gains on top of this from the steadily diminishing float. Arguably it might be simpler to leave your old intuition about capital gains in place, and call buybacks dividends. The fact is that capital gains performance had been negative, on net since the share buybacks. Keep in mind that when a firm sells a bond to buy a stock, the effect is to primarily make the earnings more volatile rather than larger. Also, firms have been issuing a lot of shares as well, and buybacks tend to result in the firm buying high and selling low due to agency problems. Finally, when a firm increases dividends that is more of a commitment to pay future dividends. Share buybacks do not have this commitment, so it again increases the volatility of of the benefit to shareholders. I wonder why Brad DeLong believes, with a dividend yield of only 2%, that investors will bid up equities by 7% over the next year. Investors only need to bid up equities by 5%. 2% will come from buybacks. This is a quibble, tho; I think the larger argument is correct and more important than it seems at first glance. That stock prices represent a rational pricing of risk-bearing capacity is rather central to DeLong’s NK worldview. I see. OK, then, but change that to firms will buy back 2% of stock and issue 1% more, so that they will buy back 1% net. That 1% net will be financed, in aggregate with an increase in firm debt, which changes the quality of future dividend payouts. It does not automatically cause an equivalent increase in the share price. Basically, with low yields, most of the value of the firm is in the distant future. At low yields, anything that changes the dividend growth rate is critical. At low yields, you care about the weather in Los Angeles 50 years from now. At high yields, you care about the weather next year. Anything that adds uncertainty to the dividend growth rate becomes the dominant factor when dividend yields are low. In a LIR environment, investors bid up the price of the stock until these effects take over. That is why you will not see dividend yields of 1% or 0.5%, regardless of what earnings happen to be. Earnings could be 50%, and it wouldn’t matter. If you need to wait 100 years to get paid, then whatever current period earnings happen to be is a lot less important than what you believe earnings will be 50 years from now, and you will discount appropriately for the increased risk. change that to firms will buy back 2% of stock and issue 1% more, so that they will buy back 1% net. No, I based my figure of 2% on (negative) net issues already. If you look at the flow of funds, negative net stock issues are about equal in volume to dividend payments since the mid 80s. Think about it this way: Imagine a firm that is never expected to pay a dividend, but is committed (to the same degree as dividend payments are normally) to buy back 5% of its shares each year. How do we value those shares? Surely not zero. I would argue as a first approximation, it should be the same as if they had a 5% dividend yield. Again, iI don’t think it affects your larger point, but it is important to be clear about this. in a world where buybacks are a, even the, main channel by which firms make payments to shareholders, you need to either call buybacks dividends, or adjust your priors about normal capital gains. think about it this way: Imagine a firm that is never expected to pay a dividend, but is committed (to the same degree as dividend payments are normally) to buy back 5% of its shares each year. How do we value those shares? Surely not zero. We do not need to imagine. This is a leveraged buy out. And to first order, the LBO does not increase the value of the firm. Therefore dividend buy backs are not a means of delivering returns to shareholders. And historically, they have not delivered returns to shareholders. The SP 500 market cap change has been negative since the era of buybacks. Now what you *meant* to say was that after the buyout, the firm will be better run, so it will start paying out profits to the new owners. That is the equivalent of dividends. The point being that *only* cash profits delivered to shareholders can justify the value of the firm. There are self-fulfilling prophecies, noise traders, and other effects. But if the firm never pays out profits, then its value is zero. So in your example, I would value the firm that was undergoing an LBO in the same way that I would value a firm that refused to pay out dividends but started to pay them in year X, when the LBO was complete or the current management was replaced. I would value the firm at a steeper discount to the firm that regularly paid out dividends, even though the earnings of both firms are the same. UPDATE: to be clear, a real firm has some positive value — the liquidation value. And it has option value beyond that, which is the value of buying out the firm and replacing it with management that pays out dividends. So the firm that always uses all earnings to buy back stock will, at some point, fall prey to arbitrageurs that will “unlock” the earnings of the firm and convert them to dividends. But the reason why it falls prey is because the current shareholders price the stock of the firm low enough to make it attractive to the arbitrageurs, assuming that the hostile takeover incurs some costs to the (irrational) firm. Hm. We’re not communicating here, which may mean that I’m confused. One more try. I did not mean that the firm would be better run. I’m assuming two identical firms, one f which pays dividends, and one of which does buybacks. And I’m claiming that to a first approximation, paying $1 in dividends should be economically equivalent to a net share buyback of $1. Again, let’s assume a firm never pays a dividend, but buys back 5% of outstanding shares each year. My contention is that the value of a share in this firm should be the same as if it had a dividend yield of 5%. One way of seeing this: Suppose each shareholder sold back 5% of their holdings each year. Then each shareholder receives cash each year equal to 5% of their holdings, exactly as if the firm were paying a dividend. Meanwhile, the aggregate value of shares outstanding does not change. Look at it another way: When a firm buys back its shares, the cash leaves it balance sheet. It’s not receiving anything in return. (I hope you won’t dispute that!) Someone is receiving the cash. And that somebody is the shareholders. No? Say a firm has a book value of $100, earns $10 each period, and uses all earnings to buy back shares. The risk free rate is 2%. The firm has a 1% chance of bankruptcy each period. In the event of bankruptcy, the liquidation value is $100. What is the value of the firm? Does the firm “deliver” earnings to investors as a result of buying back shares? If the firm is mispriced, what arbitrage strategy do you suggest to bring the firm back to its fair price. Suppose that the same firm pays out all earnings as dividends each period. What is the value of the firm now? What arbitrage strategy could bring the firm to its fair price? Now, suppose the liquidation value is zero. Then what is the value of the firm in both cases? The point of the example is to say that the present value of dividends is the fundamental value of the firm. You can also assume that the value of the firm is derived from its earnings *only if* you add additional behavioral and fair valuation assumptions. Drop those assumptions, and you are left with the present value of dividends + liquidation value as the only way to value a firm. If your arbitrage strategy relies on re-selling the firm next period, then it is susceptible to self-fulfilling prophecies and your strategy is not guaranteed to succeed in correctly pricing the firm. If your arbitrage strategy consists of matching cash-flows that are independent of the share price of the firm, then it is more likely to succeed in arriving at a reasonable share price. In the original post, I was trying to drop the ideal assumptions and therefore was arguing that investors do not take delivery of earnings via share buybacks. Add the ideal assumptions back in, and I am wrong to say that.